Most people that read our site are recreational bettors. Chances are you are too. 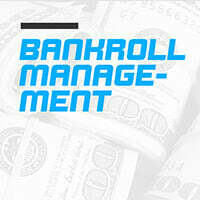 So, listen good when I tell you that bankroll management is one of the most important things you can learn. You manage your bankroll in such a way so to avoid going broke. For most people it’s not ‘getting it’ that hurts them. Or, even agreeing that bankroll management is a good idea. The problem for most people is sticking to it. Seeing their plan through, even when the going gets tough …or really, really good. Bettors get all screwed up even when they’re winning. First – what is tilt? The term comes from poker. That’s where I first heard it, at least. The best way to think of it is like this: your feelings on a scale. When everything is normal, you’re balanced. No emotions swaying your decisions one way or the other. But when something really good or really bad happens, some people’s scale will ‘tilt’. People who allow themselves to tilt often do (stupid) things that are out of character. They make bets larger than they’re supposed to according to their guidelines. They blow their bankroll and deposit more money. They go after the longshot bets. This can happen to you, no matter if you’re winning or losing. Usually when you’re losing, though. Either way the result is you usually lose money. The good news – tilt it an emotional response. It’s perfectly within your ability to control how you feel, and how you react to your feelings. It takes practice. But you can get there. For starters, you need to follow your bankroll guidelines to a T. I’ll give you an example of what you can follow in just a sec. You also want to view your money as a tool. That way you detach yourself from it. Just look as your money as a tool for making more money. I also recommend not being results oriented (be process oriented instead). That means not looking at your bankroll or win/losses every day. Those are just a few tips to help you tilt less. Now, let’s look at some bankroll guidelines. Say Bill has $500 to bet on sports for the entire football season. And if Bill loses his bankroll he’s done. Because if he tops it off, his wife said she’ll leave him for the milkman. So, it’s in Bill interest to make his money stretch for as long as he can. He should spend no more than 1-2 percent on any given line/match. In this case that means he’d bet no more than $5 or $10. That also means that if Bill loses money, he’ll wager less on future bets. But if he wins money he’ll be able to bet more (which helps to curve the temptation many bettors have). Make sense? It’s pretty simple. Keep in mind you may have to make adjustments to your strategy if you don’t have $500 to deposit. You may have to adjust your strategy to bet the minimum until you’ve won enough to bet 1-2 percent. Of course, you could bet more than 1-2 percent. You could bet 5 percent. Even 10. But you need to remember that you’re still going to lose, and that there’s a fair amount of variance when it comes to any form of gambling (especially coin flips). If you bet 10% it is VERY possible Bill goes broke due to a streak of bad luck. In which case Bill’s wife will start flirting with the milkman. So, I recommend you stick to my guide above. One other thing – it’s important to realize it’s not just about the amount of money you have and how much you bet on each line. It’s also about the types of bets you make. For example, straight bets are the best for smaller bankrolls because they’re pretty much coin flips. You have a 50/50 shot of making money. Unlike betting on parlays, or some other kind of long shot option. They can pay off – if you win – but winning these are far and few between. Much farther than a straight bet. Bankroll management is important. That much should be obvious. But what’s equally important – if not more so – is managing your inner game. Avoid tilt. Avoid greed. Avoid stupidity. If you can do that you stand a chance at making a few bucks betting on cricket matches. For more tips I suggest checking out our strategy section.